It's been two years since Barnabus Bauer (and his furry buddy, Scruffs) disappeared on a drive along a rural route somewhere in New Hampshire. His family's moved on, left him behind, carried on with their lives… but now there's a federal agent on his son's doorstep, claiming dear old dad is, in fact, still breathing. He's alive, but he certainly isn't well – you see, the experiments he endured on that flying saucer have left him somewhat physically impaired. And by somewhat, I mean the man now has six arms and an interesting growth on his forehead. From there, things start to get a little weird. While the subject of grey-skinned, black-eyed visitors from another planet with a penchant for probes may look like something straight out of the early '90s, the material feels fresh enough that this trip down memory lane is a pleasant one. If anything, I admire Groom Lake's gumption for taking on a theme that's all but taboo at the moment and meeting it head-on without a flinch. I'm sure we've all been burnt out on aliens and extraterrestrial culture since the subjects were run into the ground some time before 2000, but it's refreshing to see them again in such an imaginative, mildly satirical modern story. 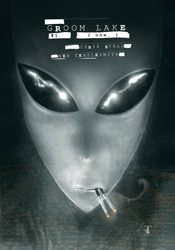 Chris Ryall's plot draws from both The X-Files and Men in Black, matching the constant unease of Scully and Mulder's investigations with the oddball characters and large alien population of MIB headquarters. It's strangely grim and somber in tone, but keeps an energetic pace and constantly works to surprise its audience. Ryall's cast is colorful and interesting, a broad mixture of different personalities that's already begun to gel into a single unit. If the first issue is any indication, I'm anxious to see the twists and turns they'll endure in the next few months. I've been a big admirer of Ben Templesmith's artwork since I picked up the first issue of Fell, his collaboration with Warren Ellis. If you're already familiar with his abstract, textured style, it should suffice to say he stays that course in Groom Lake. If this is your first time, well, you should really grab a few issues of Fell or Wormwood: Gentleman Zombie while you're out, because you're probably going to want to see more. Templesmith's ability to take control of the page is a sight to behold, and it's in full evidence here. Coloring over his own artwork, he subtly sets an early tone with an eerie, unsettling green tint that slowly rolls in over the first few pages. It's a gentle change, like the shift from sunset to dusk, so casual that I didn't even notice until the little green men materialized to surround the narrator. I could swoon over some of Templesmith's larger compositions. The simplicity of his rough, sketchy line drawings is balanced neatly by the sharp graininess and dirty tendencies of his coloring and additional effects. He's one of the few real talents out there who's able to not only produce something I'd be proud to hang on my wall, but to do so on a very regular schedule. Groom Lake was a nice surprise. I feared the worst when I first laid eyes on the cover, which looks like something that was left behind when I moved out of my old high school bedroom, but it was worth the risk. This is an unusual mix of black humor and disturbing science fiction that features a strong, small cast, simple, believable dialog and one of my favorite current artists. Buy it.